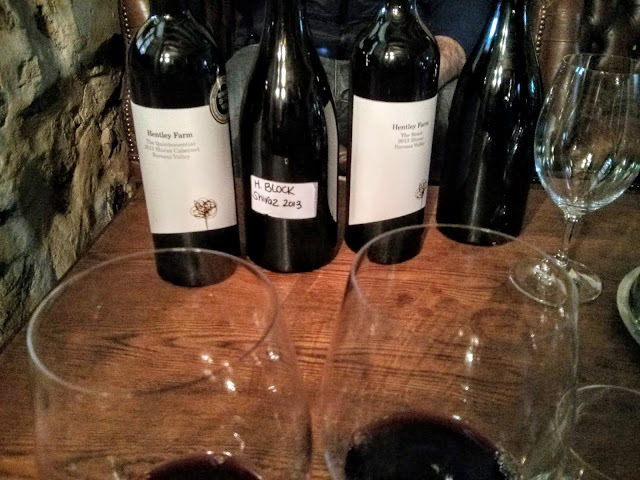 For those of you who have been following along, you know we have recently had a tasting and a master class with wine maker Andrew Quin of Hentley Farm from the Barossa Valley South Australia. 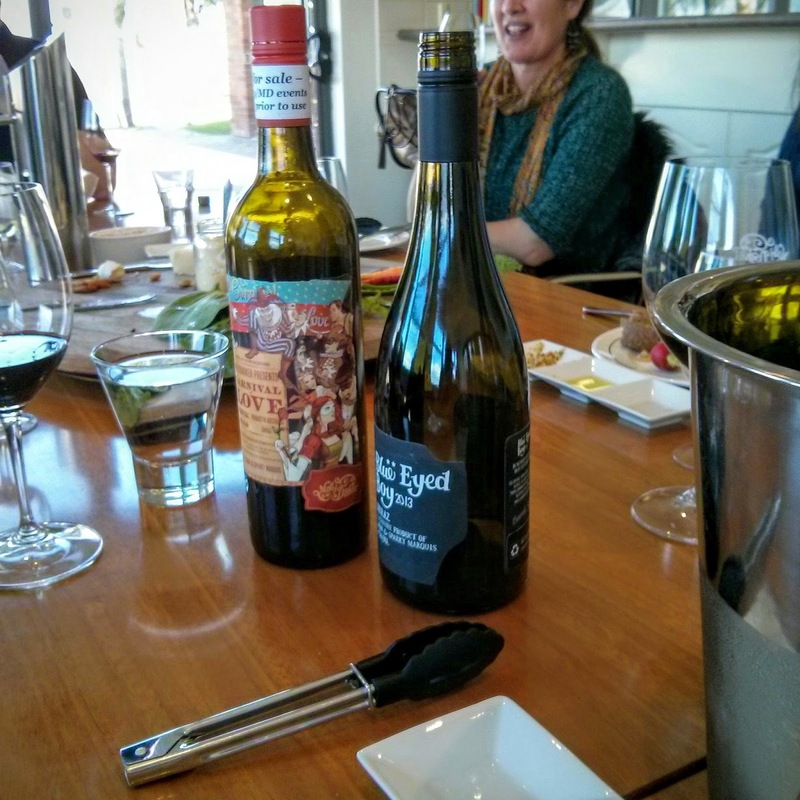 The first tasting and the first time we met Andrew was in Carmel California at Southern Latitude Wines. He was on a world tour promoting Hentley Farm wine and upon tasting the current releases we were reminded of why we liked Hentley Farm wines. 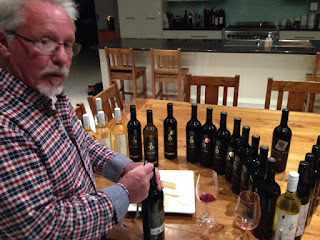 Jump forward a month or so and upon arriving in Adelaide South Australia for a visit, we once again ran across Andrew as he presided over a master class at the National Wine Center in Adelaide. We met Andrew at the cellar door and it was inside for a warm up taste of some lovely Eden Valley Riesling. Once Andrew had got things going it was off for a cruise around the vineyards. Set on the red-brown soils of the western Barossa Valley, Hentley Farm founders Keith and Alison Hentschke (not related as far as we know) acquired the 150 acre vineyard and mixed farming property in the 1990s following extensive research to find out where the best red wine grapes in the Barossa Valley were being produced. 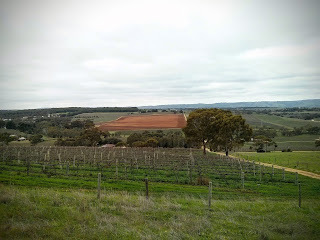 During the researching of areas their studies led them towards the rich red and brown soils of the Seppeltsfield area. Keith used an old soil map from the 1950s to strategically locate the best parcels of land and after a number of years acquired Hentley Farm. 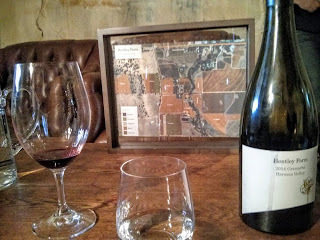 The Hentley Farm story is very short by some Barossa Stories but the with a focus on perfecting the vineyards, the first wines weren’t even released from the property until 2002. The estate was extended with the purchase of the neighboring high quality Clos Otto block in 2004 (nice purchase by the way). The most noticeable thing about the vineyards is the abrupt soil transitions and the surprisingly large elevation differences. One of the terms that came up in conversation with Andrew was 'winegrowers'. At Hentley Farm their philosophy is to grow great grapes and then just guide them along to be the wine nature intended. Thinking about that statement and after driving through the various vineyards it seems like a natural term. What at first seems a little strange makes total sense once you have tasted the wines and looked at the vineyards they came from. The range of wines are definitely each very unique and with names like The Beauty and The Beast, the wines reflect those differences. After a number of tastes from barrels it is easy to see how these wine evolve. So beautifully structured and balanced. 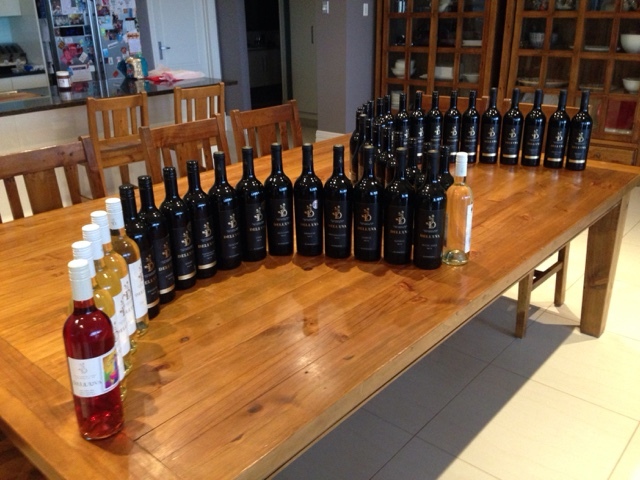 Next up was a tasting of the current release and a couple special wines inserted, well because Andrew wanted to. Thank goodness he did. Sitting in the Tally room tasting these amazing wines was a great opportunity and to do it and discuss opinions and observations with Andrew made it even better. Andrew is an astute and gifted winemaker and is one to keep an eye on. Not only that, he is a genuine nice bloke. 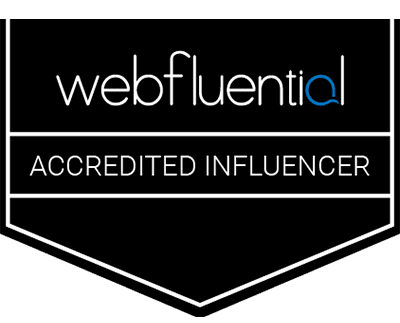 With a range of wines that are continually earning awards from all over the world what more could you want? How a bout adding a world class restaurant to the cellar door experience! 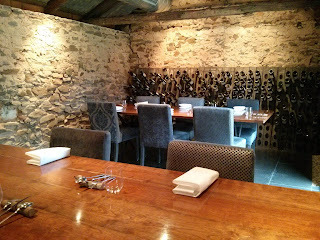 The stables at Hentley Farm, originally built in the 1880s overlooking Greenock Creek, have been beautifully restored and converted into a wonderful contemporary yet still rustic dining room. Head chef Lachlan Colwill offers two set menu options, the Discovery menu and the du Jour menu, which are created according to what is abundant, fresh, and of the highest quality. He has a strong focus on harvesting produce from the farm’s 150 acres, including foraged ingredients growing wild, as well as fruit, vegetables and herbs grown in the garden beds and orchard at the property. 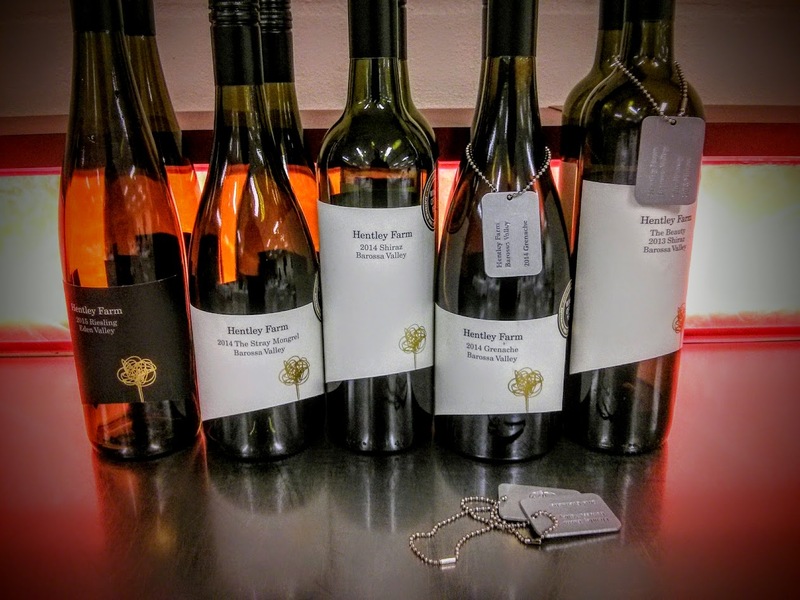 All the wines that are beautifully matched with the menus are from the Hentley Farm portfolio, and some are unique to the dining experience only. 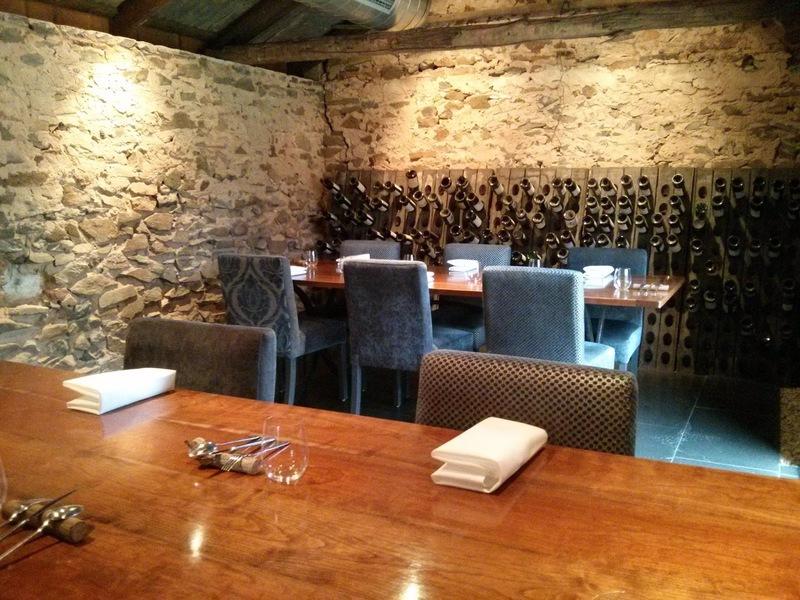 “Best Restaurant in a Winery” category at the coveted 2014 SA Restaurant & Catering Awards. South Australia’s Best Restaurant of the Year and Best Regional Restaurant in the Advertiser 2013 Food Awards. No small accomplishment, and after having a good feed with the du jour menu, taking about two hours, we can only agree that this place is simply amazing. The menu is not based on the food components that I would choose, but having no choice I ate it, and I was totally in food and wine heaven. The menu changes based on seasonally available ingredients, but rest assured it will be wonderful and delicious. Thanks to Andrew and the Hentley Farm and Hentley Farm Restaurant team for making our day so special. 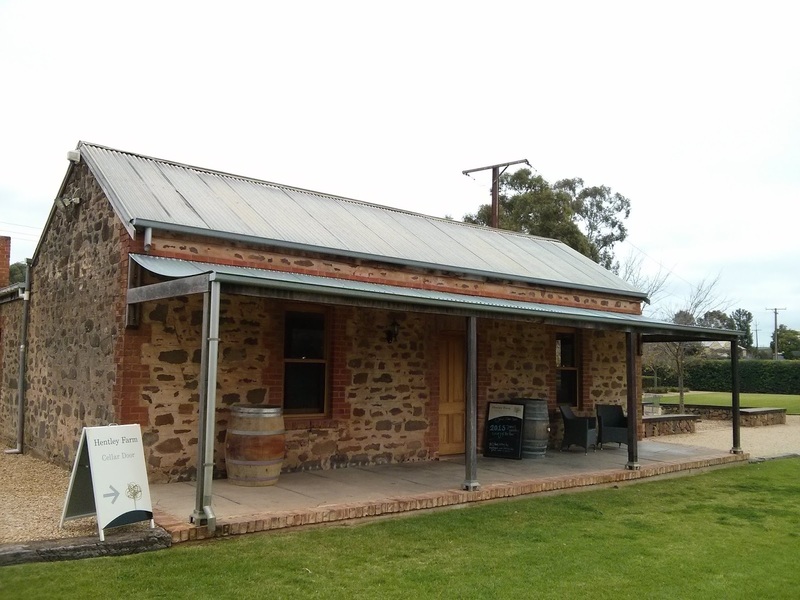 Seriously, a 'must do' if you can get to the Barossa Valley. A molly what? A Mollydooker. What is a Mollydooker you ask? Well the simple Aussie answer is a lefty. A mollydooker is an Australian expression for a left-handed person. One’s dukes or dooks are one’s hands and is similar to the American term to duke it out, to fight with the fists. The other half of your term, molly, and the implication seems to have been that anybody left-handed was a bit off in at least one respect. There are various spellings for the slang term, including molly-duker, and there’s also a related form, molly-hander. 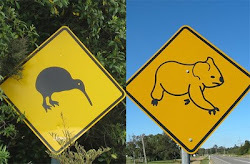 It’s first recorded in Australia in the 1920s. Also a term used for left handed boxers, a Mollydooker. So now that we have that established, why are we talkin about this Mollydooker? 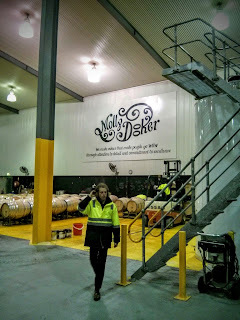 Well we just had a smashing visit to the world famous Mollydooker Winery and Cellar door in the amazing McLaren Vale region of South Australia. Why would anyone call a winery Mollydooker? So we asked that question, as we are good like that. 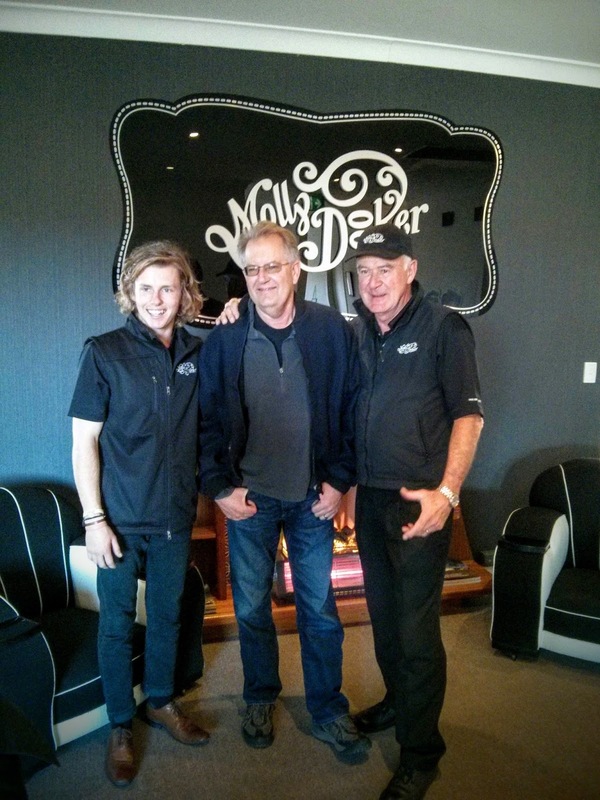 Turns out the owners of Mollydooker, Sparky and Sarah, are both lefties! 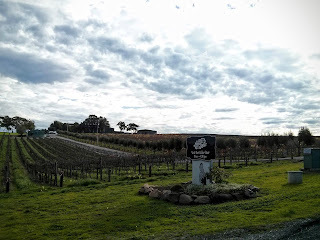 We arrived at the winery spot on 10am after a 45 min drive from the eastern suburbs of Adelaide. The new, or at least new to us, Southern Express-way making all the difference as the morning traffic was a bit more than expected. 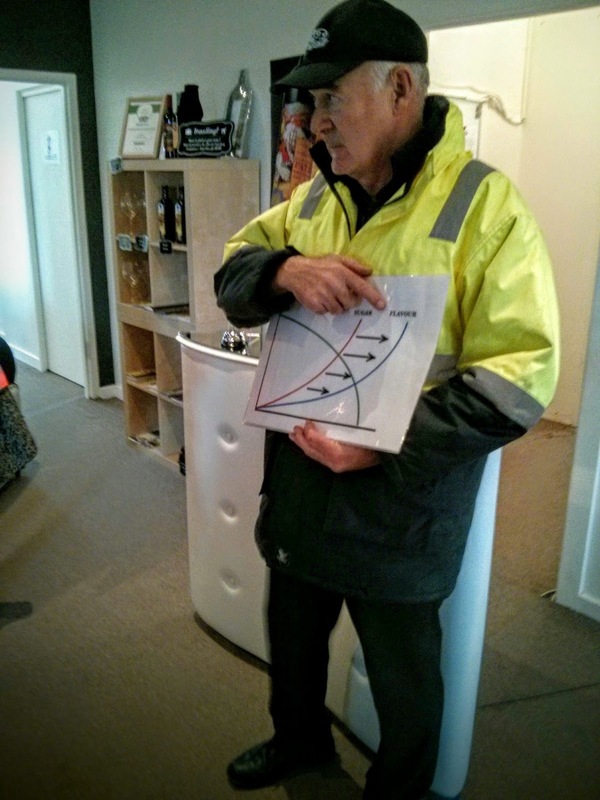 Lee explaining the palate weight theory. 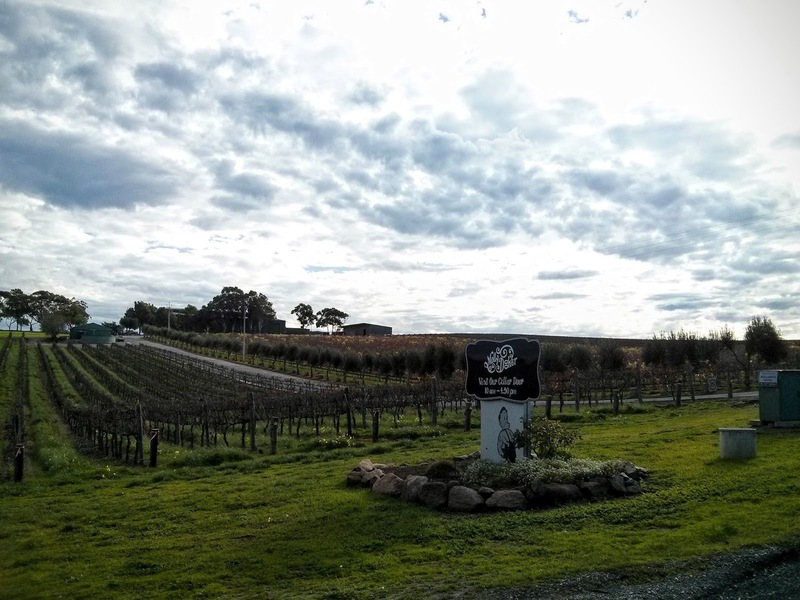 McLaren Vale is a magical place and the Mollydooker winery and vineyards sit in a lovely part of it in a place called the Seaview Ridge. With its ancient soils and Mediterranean climate, it is home to some of the most iconic Australian wines. 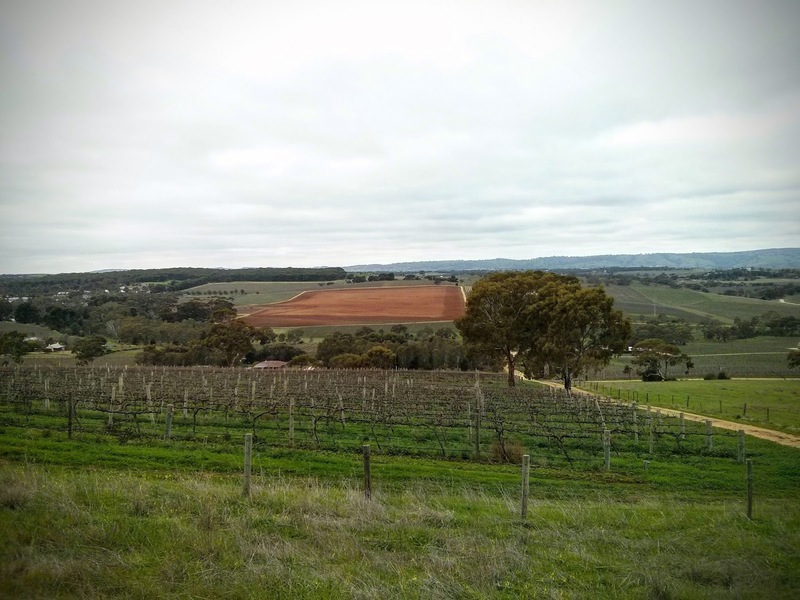 Here they have three separate vineyards – Long Gully Road, Coppermine Road and the Home Blocks, with a total of 116 acres of Shiraz, Cabernet and Merlot. As a bonus all of their grapes are grown sustainably. Greeted by Jess (organizer extraordinaire) and Lee (Sparky's Dad) and after the obligatory Mollydooker handshakes we were fitted with the obligatory safety vest for touring the facilities (Aussie thing) and introduced to the 'Blue Eyed Boy' himself, Luke. With the team in place, Lee delivered the story of Mollydooker and the philosophy of Sparky. Fascinating stuff and with some practices very different than most. The way the vines are pruned and in particular the way in which watering is managed is very interesting and something quite unique to Mollydooker. We did not venture out into the vineyard as the wind and light showers made it a bit unpleasant outside. Instead Lee had visual aids and a great set of facts and stories to get us started. After the intro Lee and Luke lead us off into the production facility for a good look around. One of the most important things we learned was that you should not let wine makers get a big head. One of the methods used to prevent this from happening at Mollydooker are the crushers are marked, small, medium and big. It used to read large but that was to many letters for those wine makers. A well laid out facility with tanks full of good wine. How do we know the wine was good? We took some out and tasted it. A number of times to be sure! For those enquiring minds the latest release Velvet Glove is a bloody rippa! We were lucky to get a taste of this as it was the day before bottling. Talk about good timing! Lee also explained how barrel toasting started. An interesting theory and quite amusing although we won't repeat the story here, but you should ask when you go. We wrapped up the tour with a long lunch where we enjoyed great food and wine and more great stories from Luke and Lee. All local produce and was it tasty! A wonderful feed with great wine. Lee's wife Janet even came by to say g'day and have a chat. 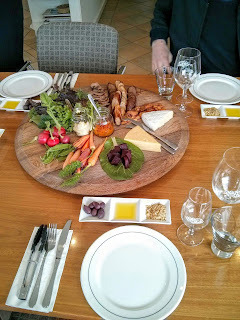 Look if you get a chance, book a tour and have a long lunch as well as the taste, and never look at tasting wine the same way again, we highly 'recommend' you do. Cheers to Lee and Luke for being great and entertaining hosts. Hope your birthday was a beaut the next day Janet. 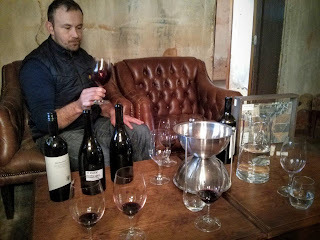 When last we spent time with Wayne of Dell'uva Wines he was in the recovery stages of three knee surgeries (no he only has two legs, one was done twice) and had yet to put any wine into a bottle. The tasting of his wines in barrel was a huge tease of the wonderful wine to come. When going back to the Barossa this year it was high on the list of things to do. We just had to go back and check out how things have been progressing. One of the interesting things about the wine industry is the many theories and methods used to create good wine. Some methods are just done because that is the way its been done for generations, and some are based on study and research and there are any number of ideas in between. Vineyards and vineyard management is no different. From the idea to plant the vines on hills and stress them all the time logic to the variety of different soils that are claimed to be best and any number of other unique beliefs. 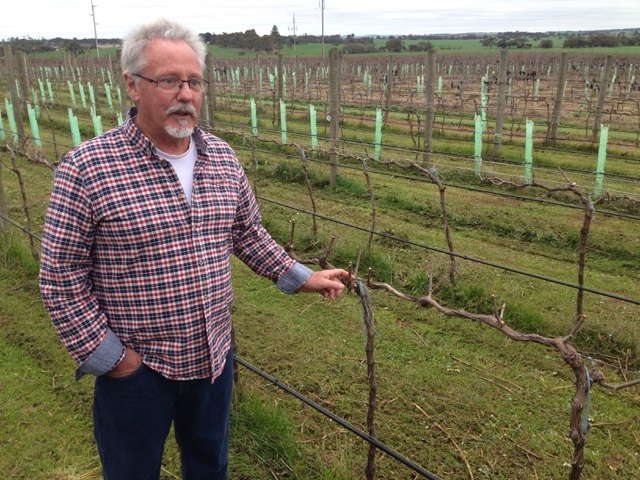 According to Wayne, of Dell'uva Wines, premium quality starts with the careful selection of rootstocks, and with his focus on those specifically suited to his northern Barossa soils and growing conditions. With a diverse range of clonal varieties sourced from Mediterranean climates that are carefully matched and grafted to the carefully selected rootstocks to maximize flavors through biodiversity. Wayne has his biggest spaced vineyard planted at a density of 6500 vines per hectare to further maximize fruit flavor which is quite a departure from the norm. The Sangiovese vines lead the pack at 11,000 vines per hectare. Do we hear a collective 'crickey'? At Dell’uva, the selection work with premium clones is never-ending and they have ongoing planted trials to continue their never ending research into quality improvement. After spending many years travelling the world, visiting vineyards and trying wines in their native environments, Wayne spent over a decade of his career visiting all of the top wine producing regions of the world in a quest to establish what it actually is that makes great wine. Wayne and his family became committed to bringing these wine styles to Australia and the Barossa Valley. Wayne has one of the largest collections of European varieties in Australia, with 44 currently planted for wine and a further 55 planted for future evaluation in just 50 acres. Wayne is passionate about his vineyards and wine, and he only use's approved organic chemicals such as a small pinch of sulphur to help preserve the wine after bottling. Its all about what the vine gives you and so no artificial tannins, no flavor enhancers, does not filter or fine his wines. He uses no egg whites and no milk products and all his growing methods are organic. Wayne takes vineyard care just as passionately and sprays rarely and only with organic registered copper and sulphur to control the occasional outbreak of mildew. He does not use any systemic fungicides or any insecticides but relies on mother nature to help. 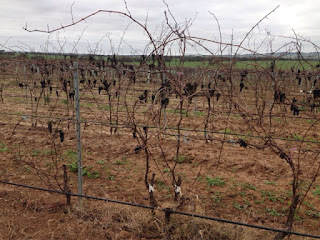 On the property Wayne has a rich population of native wood swallows and Murray magpies, willy wagtails and bearded dragons that clean up the grubs in the vineyards. Ladybugs keep the aphid population in check, and the free-range chooks graze noisily on insects in the permanent mid-row grasses. While some may consider Wayne a little touched, there is no doubting the quality and drinkability of his wonderful wines. Our humble opinion is these are destined for many 90+ scores and Gold medals. The additional attention to detail and the application of the things he has learned from traveling and studying the worlds best vineyards are being put into play in his vineyards. We will be keeping an eye on Dell'uva Wines to see that our predictions are correct. 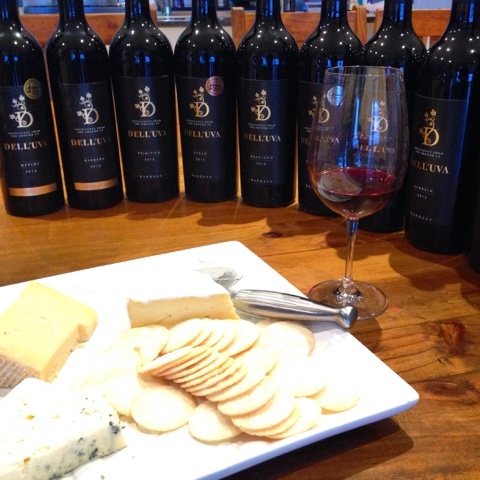 If you can get a chance to taste some Dell'uva wine take it, we highly 'recommend' you do. You will be glad you did.